Instead of giving your guests a pouch of Jordan almonds, (I say “meh”), dazzle them with wearable art favors! This past weekend, my entire wedding party was decked out in custom buttons designed by the bride’s brother and brought to life by Busy Beaver, an online custom button shop. Everyone showcased their Santa Fe wedding love with a “Dia de los Muertos” bride and groom and a red chile heart. Que cute! Have you ever wanted to know the difference between a yacht and a boat? The answer is superiority. Yes, my friends, a yacht is far superior to a boat. How does this apply to weddings, you ask…in the middle of a desert? Well, I’m sure you all have been to your share of weddings. There was probably dancing, some cake and a few cheesy toasts. But, have you even been to a really, totally, crazy-awesome wedding? I’m talking about where everything felt perfect, seamless, sincere and magical? The ceremony gave you warm fuzzies, there was laughter, tears of joy and you danced your buns off until the wee hours? That’s what I’m talking about: the yacht of a wedding. What’s the secret to throwing such an event? There are certainly a few tricks to making this happen. It doesn’t just come together because you’ve checked the necessary objects off the ol’ list. Well, I got a photographer, a cake and some flowers…I’m good to go, right? Ehhh, there’s a little more to it. It takes plenty of planning, thought and a good amount of elbow grease. First off, coordinating a yacht of an event requires a captain and a crew. You may not realize it, but as you hire your vendors (florist, photographer, baker, caterer, DJ etc. ), you are assembling a crew. They will work with you through the entire planning process and they will also be working with each other. You want to make sure you have the best support team you can get. This doesn’t necessarily mean you need the most expensive team for your wedding to be perfect; you need the fit to be perfect, for you. Next, you’ll need a captain. And let me tell you, it’s pretty hard to be the captain while you’re trying to be the bride or groom, or mother of the bride…you get the idea. The captain should be at the helm, overseeing the event from an objective point of view, when you should be in the middle of the event, having a great time and being with all of your guests. If you’re able to enjoy and be present at your event, your guests will enjoy it too. As the host, if you’re worried about the plating of the cake and the cueing of the songs, you won’t be present to enjoy the cake or the songs. Wedding planners come to the rescue as the woman (or man) behind the curtain, making sure everything goes off without a hitch, attending to anything that may arise and keeping your day smooth and enjoyable. Allow someone removed from the party to be your safety net, to take care of the small things and trust them. The whole point is to have a great time at your own wedding, right? But most importantly, and I can’t stress this enough, a yacht of a wedding is one that truly reflects the bride and the groom. That is the simplest piece of advice I can give. Your wedding doesn’t have to be expensive and super-fancy to be amazing. The best weddings I have ever witnessed are the ones that are infused with the couple’s personalities. Incorporating elements that represent who you are as a couple will translate to your guests, the people that know and love you. It will tie the experience together with a beautiful thread and create a memorable event for everyone. When you think of the Southwest, the first word that comes to mind isn’t usually Sensual. It’s usually Dry. Hot. Barren. But as most folks come to know, especially after they’ve visited Santa Fe, it is a magical place, one where the skies turn colors you’ve never imagined. The air is different, cleaner, more crisp. The landscape that seems barren at first is actually filled with beautiful Piñon trees and the dirt seems to be shaded with an artist’s terra cotta crayon. There is something sensual about it. I think that is why so many people are drawn to get married in New Mexico. There is a certain magic and spirituality about it. 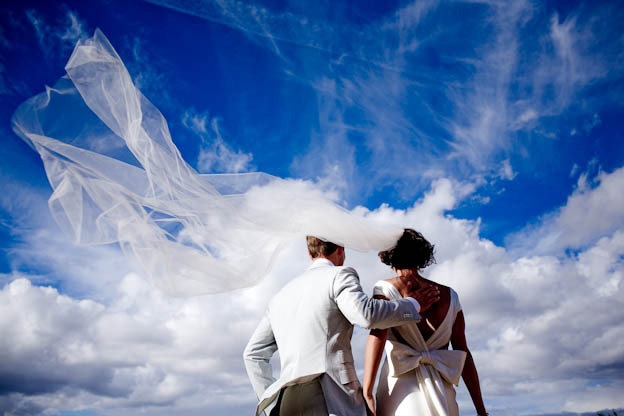 The trick is, how do you plan a wedding that captures the magic of New Mexico, the sensuality. I’ve created the inspiration board above by taking cues from the delicate, sometimes, unnoticed elements of the Southwest; the ones that get overshadowed by Bright Paper flowers, serape blankets and cowboy boots. No.1~ The color palette is drawn from the dusky shades of a sunset. Once the bright, burning sun has gone down, we are left with subtle hues of purple, mauve, peach and gold. 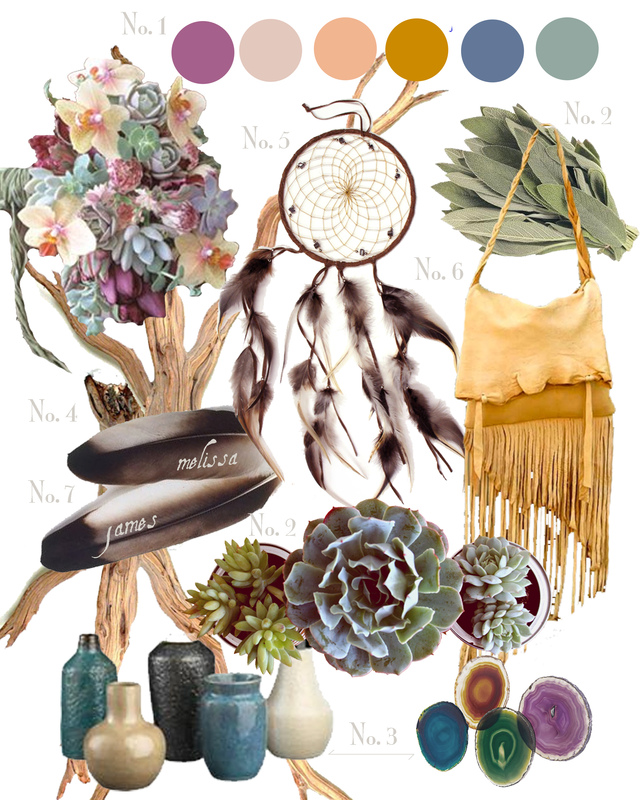 No.2~ Succulents can completely take the place of flowers or sing a perfect second fiddle in a bridal bouquet. They stand amidst the glow with their silvery-green color. This shade is often found in the New Mexico landscape, complimented by beautiful Sage bushes. No.3~ Handmade pottery and gemstone slices are a great way to incorporate sleek textures and rich colors into your wedding. Different, handmade bud vases dotted down a table are far more interesting than one, single arrangement in a bubble bowl, don’t you think? I love Mama’s Minerals in downtown Santa Fe for some rad rocks! No. 4~ Ghost wood brings an organic and rustic feel, reminiscent of Georgia O’Keeffe paintings. These placed on tables and accented with a few blossoms is a unique and interesting way to adorn your wedding tables. No. 6~ Deerskin fringe softens the look and can be wrapped around bouquet handles or used as an accent on the tabletop by way of napkin ties or votive candle adornments. Did you know that deerskin lace comes is all sorts of colors too? No. 7~ I just adore the idea of using a rubber stamp to ink names onto feathers as a place card option. It can become a wonderful keepsake for your guests to remember their stay in New Mexico. My name is Jessie and I operate a boutique wedding and special event planning service in Santa Fe, New Mexico. I’m so glad to have you visit my blog, The Hitching Post! This is a place where you will discover real weddings happening in Santa Fe and gather ideas for making your own wedding unique and thoughtful.